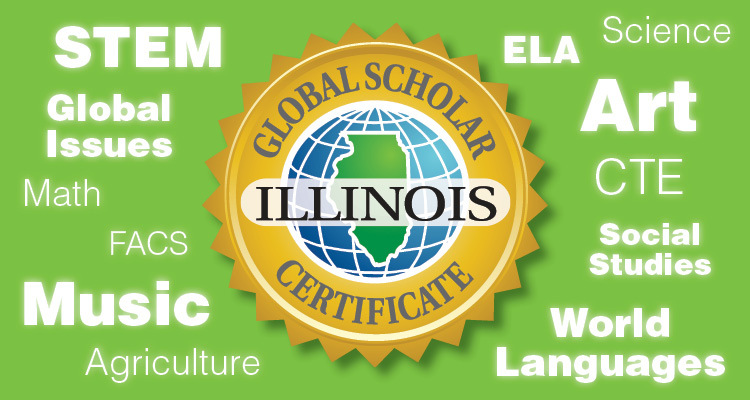 The Illinois Global Scholar Certificate is an award given by the school district in recognition of students who demonstrated global competence through coursework, global dialogue experiences, service learning and a capstone project meeting specific criteria. 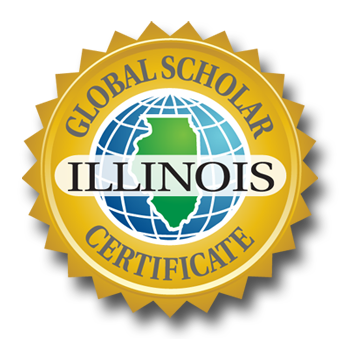 The Illinois Global Scholar Certificate will appear as seal on the Illinois school transcript or diploma of the graduating senior which can be used as a statement of accomplishment for college admissions or future employers. To provide a crucial skill set leading to success across disciplines including but not limited to STEM, CTE, Art, Science, Social Studies, Agriculture, and Business. To provide a vehicle that will allow students to make connections in their coursework and experiences. 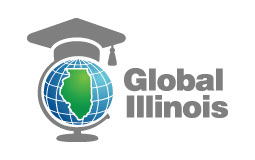 To develop the knowledge, skills, and disposition necessary to engage with the global marketplace here in Illinois and abroad. To foster a sense of global citizenship in an effort to prepare our young people to engage with people around the world to solve problems that impact all of the world. To build bridges across nations and cultures. To strengthen intergroup relationships and honor the multiple cultures both domestically and abroad. To support Illinois schools in providing the high quality, enriching experiences for young people.